The following are two contemporary news reports on the sinking of the Lusitania published in Proceedings in 1915. The first is from the European War Notes section in the May-June 1915 issue. The second is from Professional Notes in the Sept.-Oct. 1915 issue. On May 7 the Cunarder Lusitania was sunk by a submarine off Kinsale Head on the south coast of Ireland; about 1200 persons were reported lost. Of 188 Americans on board 102 were lost. While the Lusitania’s cargo included large quantities of war munitions, it is denied by British authorities that the vessel was armed and this statement is supported by Collector Malone’s report regarding her inspection at New York. In view of recent acts of the German authorities in violation of American rights on the high seas, which culminated in the torpedoing and sinking of the British steamship Lusitania on May 7, 1915, by which over one hundred American citizens lost their lives, it is clearly • wise and desirable that the Government of the United States and the Imperial German Government should come to a clear and full understanding as to the grave situation which has resulted. The sinking of the British passenger steamer Falaba by a German submarine on March 28, through which Leon C. Thrasher, an American citizen, was drowned; the attack on April 28 on the American vessel Cushing by a German aeroplane; the torpedoing on May 1 of the American vessel Gulflight by a German submarine, as a result of which two or more American citizens met their death; and, finally, the torpedoing and sinking of the steamship Lusitania, constitute a series of events which the Government of the United States has observed with growing concern, distress and amazement. Recalling the humane and enlightened attitude hitherto assumed by the Imperial German Government in matters of international right and particularly with regard to the freedom of the seas; having learned to recognize the German views and the German influence in the field of international obligation as always engaged upon the side of justice and humanity; and having understood the instructions of the Imperial German Government to its naval commanders to be upon the same plane of humane action prescribed by the naval codes of other nations, the Government of the United States was loath to believe—it cannot now bring itself to believe—that these acts, so absolutely contrary to the rules, the practices, and the spirit of modern warfare, could have the countenance or sanction of that great government. It feels it to be its duty, therefore, to address the Imperial German Government concerning them with the utmost frankness and in the earnest hope that it is not mistaken in expecting action on the part of the Imperial German Government which will correct the unfortunate Impressions which have been created and vindicate once more the position of that government with regard to the sacred freedom of the sea. The Government of the United States has been apprised that the Imperial German Government considered themselves to be obligated by the extraordinary circumstances of the present war and the measures adopted by their adversaries in seeking to cut Germany off from all commerce, to adopt methods of retaliation which go much beyond the ordinary methods of warfare at sea, in the proclamation of a war zone from which they have warned neutral ships to keep away. This Government has already taken occasion to inform the Imperial German Government that it cannot admit the adoption of such measures or such a warning of danger, to operate as in any degree an abbreviation of the rights of American shipmasters or of American citizens bound on lawful errands as passengers on merchant ships of belligerent nationality; that it must hold the Imperial German Government to a strict accountability for any infringement of these rights, intentional or incidental. It does not understand the Imperial German Government to question those rights. It assumes on the contrary, that the Imperial German Government accept as of course the rule that the lives of non-combatants, whether they be of neutral citizenship or citizens of one of the nations at war, cannot lawfully or rightfully be put in jeopardy by the capture or destruction of an unarmed merchantman, and recognize also, as all is possible, for injuries which are without’ measure, and that they will take immediate steps to prevent the recurrence of anything so obviously subversive of the principles of warfare for which the Imperial German Government have in the past so wisely and so firmly contended. The Government and people of the United States look to the Imperial German Government for just, prompt and enlightened action in this vital matter with the greater confidence because the United States and Germany are bound together not only by special ties of friendship but also by the explicit stipulations of the treaty of 1828 between the United States and the Kingdom of Prussia. WASHINGTON, May 13, 1915 —N. Y. Sun, 5/14. There were no troops [on] board. There were instructions received by the master as to the navigation of the vessel, and, in answer to the question, “Did the master carry out such instructions?” the court replied in the negative in regard to some of them. There were messages sent and received by the Lusitania with reference to enemy submarines during the voyage. The ship was attacked by a German submarine which displayed no flag. She was not armed. She was struck by two torpedoes practically simultaneously. After she was struck there were reasonable and practical measures taken on board to save life. None of the loss of life was due to neglect by the master. 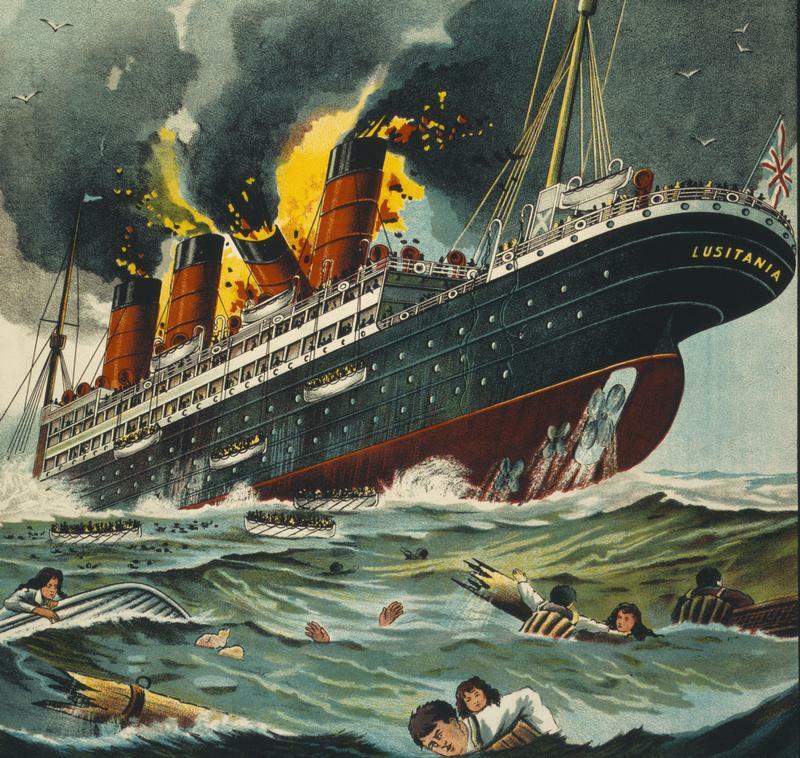 The loss of the Lusitania and the loss of life was caused by the sinking of the ship by torpedoes from the submarine, and was not caused by any wrongful act or default of the master. No blame attached to the owners. All the requirements of law were fulfilled and the life-saving appliances were satisfactory. The officers and men behaved well, and more than half the crew lost their lives. The 5000 cases of cartridges on board were stowed 50 yards from where the torpedoes struck the ship, and there was no explosion on board other than from the torpedoes. The ship sailed with six boilers closed down, speed being reduced to 21 knots. That reduction was of no significance, and was proper. The captain took proper precautions when the danger-zone was reached, speed being reduced to 18 knots on the morning of the catastrophe to secure the ship’s arrival at Liverpool about four next morning. — Army and Navy Gazette, 7/24.